Emmanuel Macron has taken a hissy fit over recent verbal attacks by the two populist political Italian leaders, Salvini and Di Maio, over immigration and the gilets jaunes (anti-French government demos) as they ramp up the rhetoric for the EU May elections. Macron has taken the unusual step of recalling the ambassador from Rome in the worst crisis between the two neighbouring countries since the second world war. Salvini is now trying to sound placatory but says France must stop pushing migrants back into Italy, end lengthy border checks blocking traffic and hand over Italian leftist militants who have taken refuge in France in recent decades. 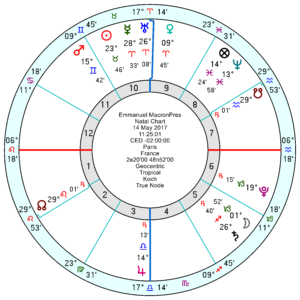 There’s little likelihood that the spat will die down soon since both Salvini and Di Maio’s relationship charts with Macron have tr Uranus in opposition to the composite Mars picking up right on cue today and running till early March – that is explosive, impulsive and tends to lead to sharp words and hasty actions. 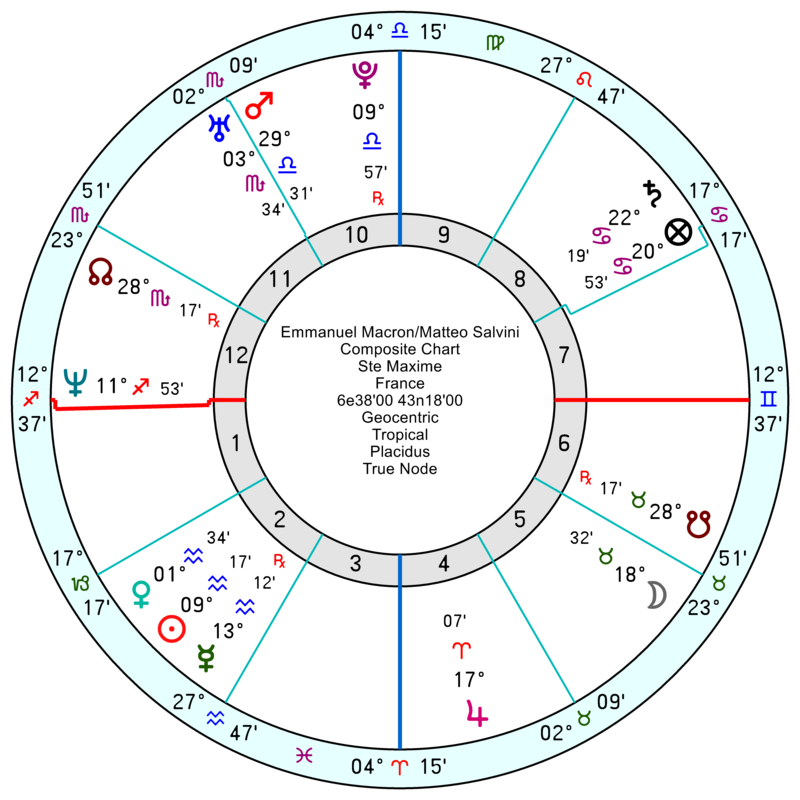 With Salvini it’ll continue to rock n‘ roll through this year as tr Uranus hard aspects the composite Venus and Uranus; and with Di Maio there’ll be a lengthy Saturnine chill. 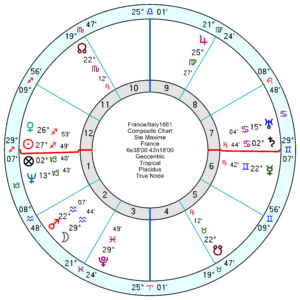 Both Italians have Mars in Capricorn square Macron’s Pluto, so it’ll be a teeth-gritter with no quarter given. 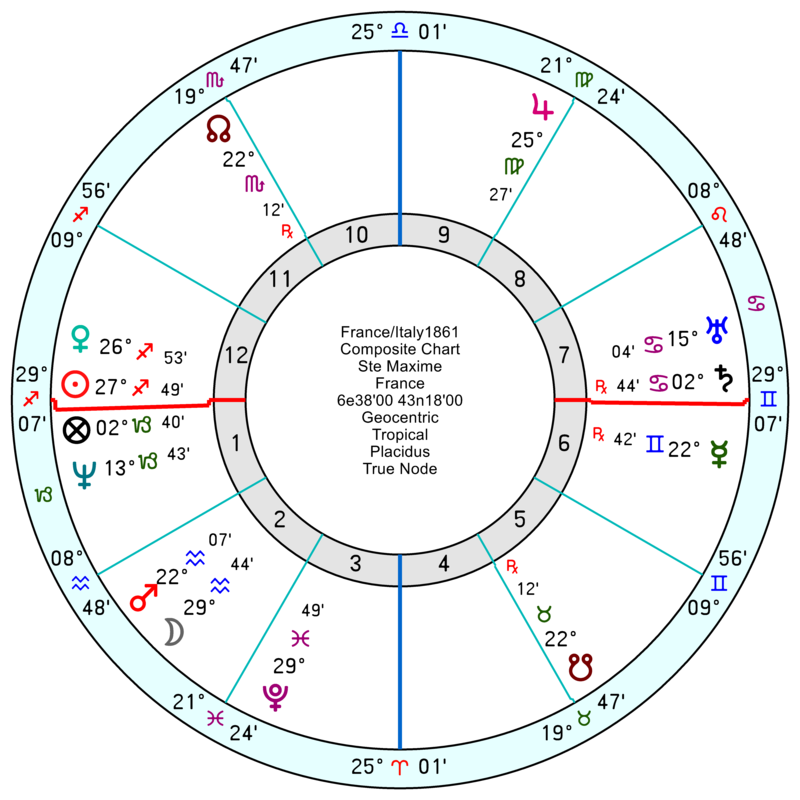 The France/Italy relationship chart is jangled exactly now by tr Saturn opposition the composite Uranus; and that lingers on and off till late 2019 with uncertainty and suspicion added to the mix since tr Saturn will also conjunct the composite Neptune. Emmanuel Macron has been bruised by the gilets jaune continuing demos and has had to make budget-bursting promises to calm inflamed feelings at a time when the economy is creaking. 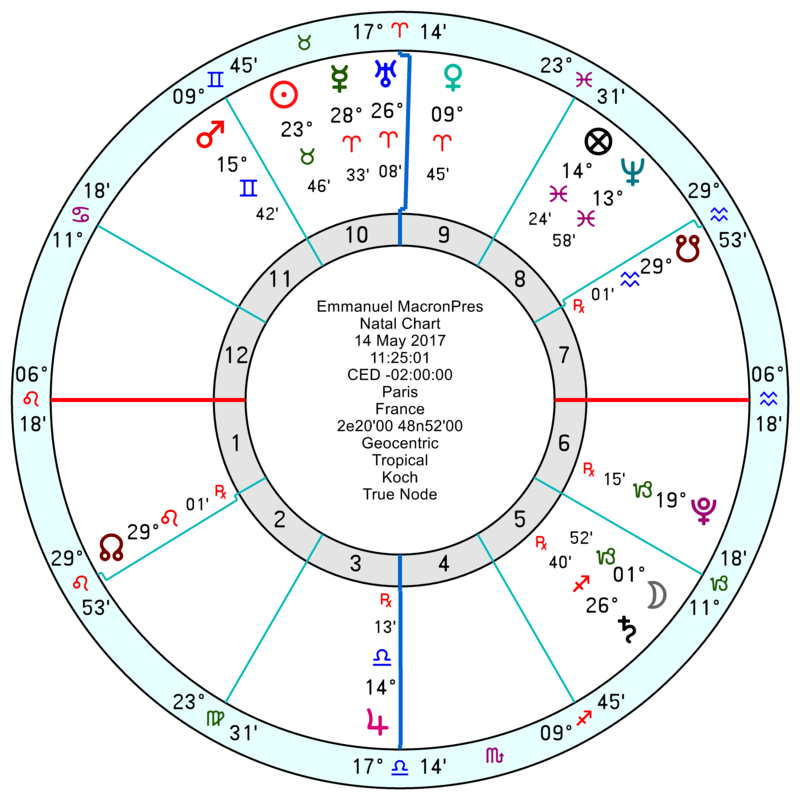 His Government chart, 14 May 2017 11.25 am Paris, is at a low ebb this month with tr Neptune square the Mars, returning till late 2019; with the over confident Midheaven opposition Jupiter square Pluto running into a series of setbacks on and off all year courtesy of tr Saturn in hard aspect. Reports in recent days of pictures taken by Hubble Telescope in 2018 of massive storms on both Uranus and Neptune. Was wondering would these events have anything to do with the Semi-Square both had? Wishing you a nice weekend and thank you if you comment/examine. The fact that one EU member state has recalled is ambassador from another EU member state almost beggars belief. That is the sort of thing you would have expected from countries on either side of the Iron Curtain during the Cold War. It certainly does not appear to be what one would expect from allies within the European Community. As I understand it French banks are holding massive quantities of Italian debt (figured in the region of 250 billion Euros have been bandied about) so I wonder if there is more to this story than the bare headlines suggest. 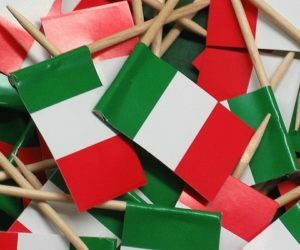 Hm If Italy goes toes up economically then it’ll be a rerun of the Greece situation but worse with the French banks – Paribas and Credit Agricole – needing rescued. In Italy, main news is their GDP grew at the rate of 0.2 per cent last year. This is disastrous, even by their standards. Obviously, current Government can still place blame on the previous one, it will be hard for them to push universal income and flat tax through with these kind of numbers continuing early 2019. Also, to be remembered, Salvini isn’t PM, even if he loves to act as if he was due to high numbers in polls. Conte, nominal PM, is becoming more vocal in opposing Salvini. He was caught on camera telling Merkel Salvini is “impossible”. Now, Conte is a Law professor, who is generally speaking incredibly measured in public. He definitely knew what he was doing there. 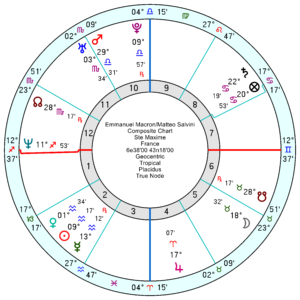 Italian Government chart is somewhat shaky – they swore in day before Republic Day, so that chart’s always querky Sun/Uranus in Gemini is always a factor here. I expect moves to be made again in May, after European Elections and seeing how Lega’s polling numbers reflect to their popularity. I have some inkling polls could be manipulated, since Salvini is openly pro-Russian, and we now know Trump’s Campaign did manipulate polls to reinforce his popularity.